• With every cover for every game coming out of EA Sports Tiburon being put up to a vote, now their siblings in EA Sports Canada are getting in on the act. NHL 13 will also choose its cover star through a fan-voted contest. Not only that, they're adopting the Madden model of a vast field, with 60 players beginning the contest in a play-in round, being pared down to a round of 32 that will be re-seeded. Voting is being held at NHL.com. I will not lie, I don't follow hockey very closely so I can't handicap who should emerge from that. 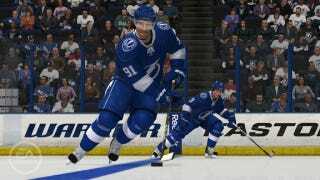 Goal-scoring leader and current NHL 12 star Steven Stamkos [pictured] is on the ballot, though, looking to make back-to-back appearances. • The special Euro 2012 edition of EA Sports' FIFA series will be a download-only title, the publisher said today. The game's U.S. price will be $19.99 on PSN or 1800 Microsoft Points on Xbox 36, 2,500 "FIFA Points" on PC. The game features all 53 UEFA member national teams, all eight official stadiums in the tournament, and something called the "Expedition Mode," which "enables fans to build, manage and compete with a customized team against other European nations." FIFA 12's full version was just made available for purchase and download on PlayStation Network. • 2K Sports will open its $1,000,000 Perfect Game Challenge on Major League Baseball's general opening day, which is Wednesday (the Mariners and the Athletics did play two regular-season contests in Japan this week). The contest will proceed under different rules this year, so to help players understand what they're fighting for, and to give protips on how to pull off a perfecto, the Cleveland Indians' Ryan Spillborghs narrates this six-minute tutorial.